While the Prestige 630 motoryacht may be the smallest of the French builder’s yacht line with an LOA of nearly 63 feet, she’s no little sister. 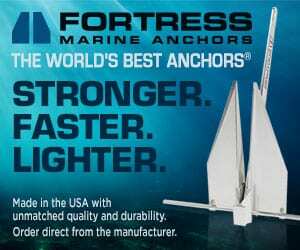 Instead, she’s a tour de force as the company’s newest model to enter the water. By teaming with Volvo Penta, Prestige used cutting-edge hull engineering from J&J Design to position the twin 725-horsepower power plants in the ideal place for high performance. one of many yachts the firm has designed for Prestige, a brand under the French builder Groupe Beneteau. 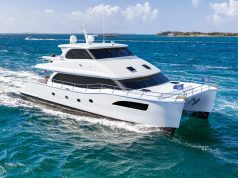 With a cruising range of 305 nautical miles at 24 knots, the Prestige 630 can easily run from South Florida to The Bahamas and back without refueling. Berton said the typical Prestige 630 owner has yachting experience and will operate the vessel on his own, without the help of guests or a hired first mate. Joystick operation around the docks and at low speeds make the vessel easier for an owner to maneuver. The addition of a Seakeeper 9 stabilizer keeps boat motion to a minimum for guest comfort, especially when riding atop the flybridge deck and its second helm. 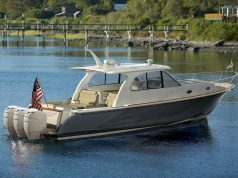 The flybridge is configured with a two-person helm seat to port, a large L-shaped couch that converts to a sunpad, and a starboard galley with grill, refrigerator and sink. Moving from the swim platform to the main deck is easy via a starboard-side staircase into the cockpit, which features a transom couch and dining table. Forward of the cockpit in the main salon through a sliding-glass door is the port-side galley. Again, space and generous storage is a major theme. 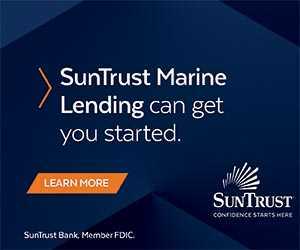 It has a full complement of appliances—refrigerator, dishwasher, four-burner stove, oven, and microwave—as well as a wine cooler. 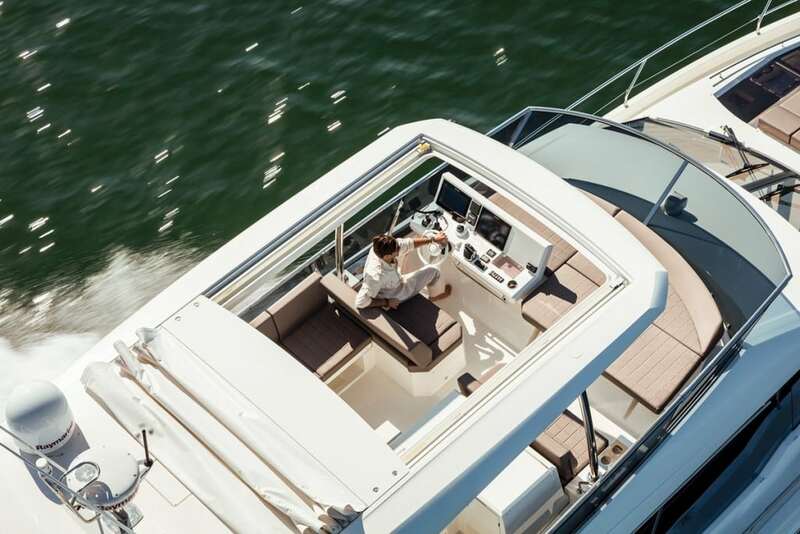 Clean sightlines up to the starboard-side main helm station allow for excellent visibility throughout, and huge windows let in an abundance of natural light. The sunshine illuminates the Wenge wood joinery and white oak flooring. Immediately forward of the galley is the salon with a port-side settee, love seat and chair. A hi-low table converts for dining. The helm station is fully tricked out with three Raymarine 165 multifunctional display screens offering a high-tech view into all the ship’s systems. The steering wheel and Volvo Penta throttles and shifters are in a good position to the pilot’s right, along with the joystick for easy operation. Wipers keep the big two-panel windshield clear during inclement weather. All guest cabins are on the lower deck, and the privacy of the master cabin is assured with the starboard-side staircase amidships in the salon. The centerline suite has a king-size bed, flat-screen TV, large hanging closet, work station, and ensuite head with shower. Fusion audio controls for the entertainment system allow for complete control from the master stateroom. The VIP and guest cabins are forward of the helm in the bow and down a staircase that offers an area for a washer and dryer, if desired. 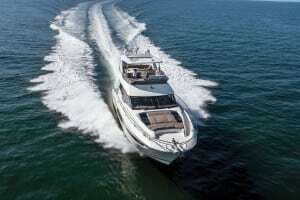 The VIP is farthest forward with a queen-size bed on the centerline and ensuite head and stand-up shower, while the guest cabin to port features twin bunks that can slide together to make a double bed. There’s also a dayhead and shower that is shared with the guest cabin. Finding places to relax in the sun is easy. In addition to the swim platform and two large sunpads on the flybridge deck, there’s another huge lounge seating-sunpad arrangement on the bow. By raising or lowering backrests, the pads can be set up for seating and sunbathing for four people or more, which is ideal when at anchor or under operation at low speeds.